Audiobook comments: I also opted to switch formats and listen to the Blood for Blood audiobook, even though I read the first book in print. Best decision ever. I find emotional stories are often more engaging and immersive in audio, and the producers chose an excellent narrator in Christa Lewis, who delivered a touching performance. She projected an overall tone that I felt was perfect for this novel, expressing just the right amount of feeling and inflection in all the right places to make all the most significant scenes stand out. I know what you mean, I love the “what if” type stories too. I haven’t read your review fully because I do want to read the first book. I need to make more time is all. I’ve been very good through October and November though, really restricting requests and trying to catch up. Haha, thanks, I needed that! And I know what you mean about feeling that way after Blood For Blood, because I did, too. And I agree with you on the character development being stellar in the sequel, and how Graudin redeemed Luka as a character. 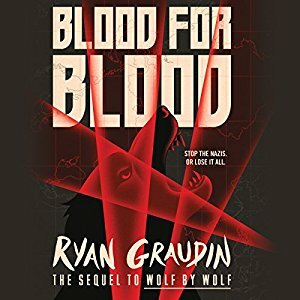 I didn’t like him at all in Wolf By Wolf – so I was shocked (in the best way possible) that getting to know him better was one of my favorite aspects of Blood For Blood. Very true, I liked how each book played to a different strength. The premise as a whole, though – wow! More authors should strive for originality like this! I did love Yael a lot. I’ll miss her!